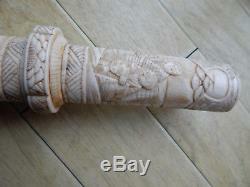 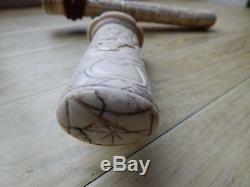 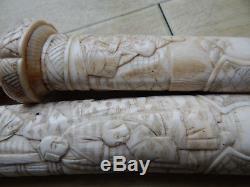 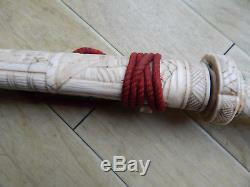 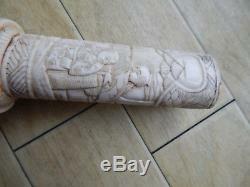 I would like to present you with an Outstanding Antique Japanese Carved Bovine Cattle Bone Tanto Letter Opener. 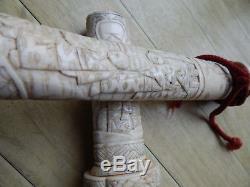 The netsuke is carved to perfection with great attention to detail. 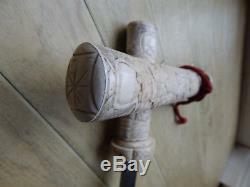 As expected with the age, the item has a hairline crack on the tip of the hadle and a small chip at the bottom of the inside part of the handle (please see photos for references). 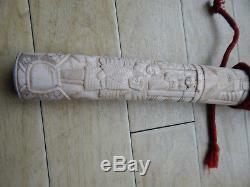 38.00 cm long and weights 452 grams. 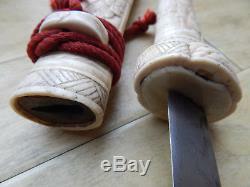 The item "Outstanding Antigue Japanese Carved Bovine Cattle Bone Tanto Letter Opener" is in sale since Saturday, April 14, 2018. 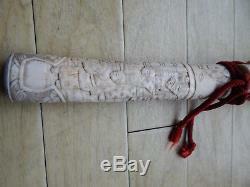 This item is in the category "Antiques\Asian/Oriental Antiques\Japanese\Netsuke". 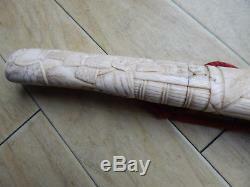 The seller is "northeastinro" and is located in North Shields.